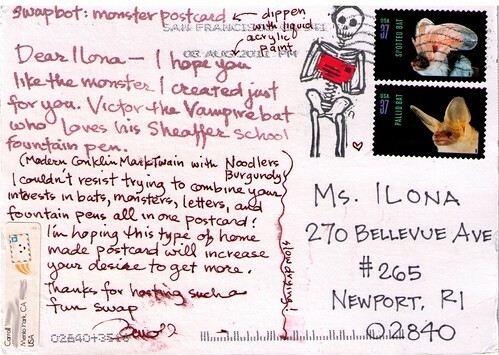 The Missive Maven: AMAZING writing bat postcard from Carroll! If you know me at all, you know I absolutely plotzed when I saw this postcard. It came to me in my own Monster postcard swap, and the amazingly talented Carroll. Oh my gravy. 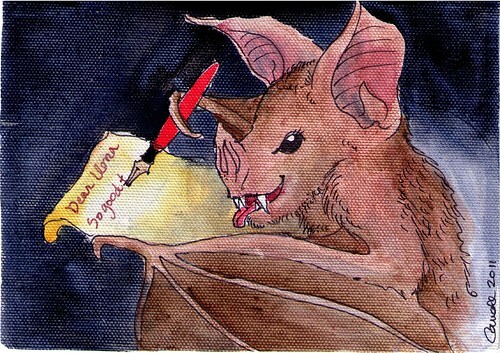 A bat, holding a fountain pen and writing a letter to me? Incredible! And what a fine bat it is! You can't tell from this scan, bit it's like this was a painting painted right on canvas. Carroll worked her magic somehow to make this beautiful yet tough, and it arrived in my mailbox today in absolutely gorgeous, perfect condition. 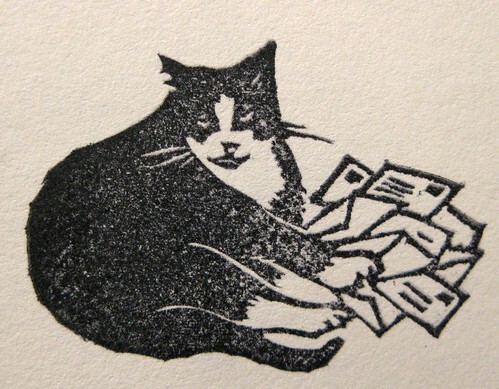 ...most touchingly one she carved for me showing my dear cat Memo ("Memo guards the mail") which I received just a few months before he died. Carroll, you have outdone yourself once again!! What a treat! WOW! That is a great monster! I love the bat! She's a very talented artist. That is such a creative postcard! Amazing.